As you've already seen we are raffling off some awesome figures at NYCC 2014. However, for those of you at Little Rubber Guys or October Toys, who will not be able to make the show, we've got your own raffle going on! Send an email to LRG@RiseoftheBeasts.com with the subject of "Raffle"
And make sure to include your forum username in either the subject or the body of the email. 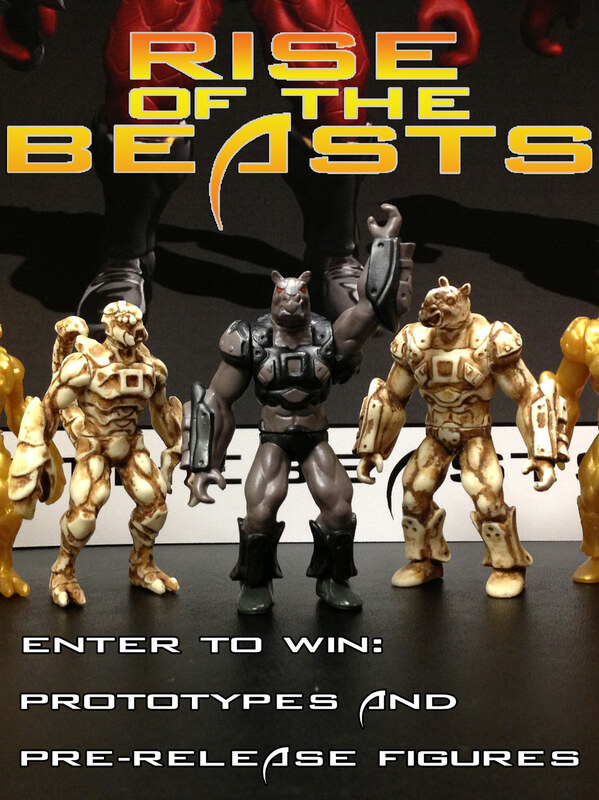 You will get an extra entry if you let your friends know about Rise of the Beasts. It can be Facebook, Instagram, your blog, your website, etc. Feel free to use any of the images HERE to share the new line with your friends. If you do this, please include a link back to your post in the ORIGINAL raffle entry. Do NOT send 2 emails. Also, please do not spam anyone. On Saturday night (October 11th, 2014) around 9pm PST, I will pick 5 random entries from all the entrants. I will then randomly assign a number 1-5 to them to pick their prize. Once done, I will email the winners to let them know they have won and then post the forum usernames of the 5 winners in this thread. Once the winners are drawn, the contest is over. You may only enter ONCE. If you are going for the extra point, make sure you paste the link back to where you told your friends about us IN THE ORIGINAL EMAIL. You must be a member of either LittleRubberGuys.com OR OctoberToys.com. When you email your entry, make sure to enter your forum username. We will email you to let you know you have won, but we will also PM you to make sure your username is valid. You must be 18 or over. If you are not, you must have your parents permission to enter. What will I do with your email address? I will add you to my mailing list for LRG Exclusive toy info, such as O.M.F.G., S.U.C.K.L.E., Rise of the Beasts, etc. I will not sell, trade or give your email address to anyone else. Nor will I allow anyone else to send you info. By entering, you agree to these terms. This is a great idea, i'm in! E-mail sent! I really love the painted Scorpion and Rhino. Edited by DaHumorist, 07 October 2014 - 01:11 AM. I'm aiming to get the bone-coloured scorpion. E-mail sent, Karis! I've thrown my hat in bud. I don't have any of that stuff, damnit! Edited by Rubberhammer, 09 October 2014 - 06:39 PM. Thanks a lot Jon, and I´m sure it wont be the only Rise of the Beasts figure heading towards my collection because I can´t wait for the release of these guys! Congrats lucky people! Can't wait to get some of these guys.